When a teacher leaves a blank book in the Writer’s Corner for her students to find, with the instructions "Please Write in this Book," she hopes it will encourage her students to talk to one another in its pages. They do, and the result is an epic classroom battle. 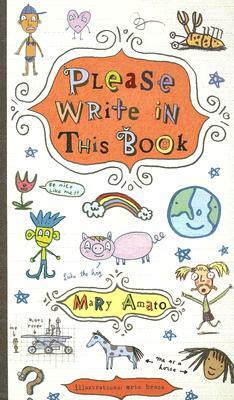 Mary Amato is an award-winning children's book author, poet, playwright, and songwriter. Her books have been translated into foreign languages, optioned for television, produced onstage, and nominated for the children's choice awards in many states. She lives in Maryland. Eric Brace is a Master Artist for Hallmark Cards, where he has illustrated and written funny things for over 25 years. He's been using similes, idioms, and metaphors ever since the third grade. Residing in Kansas City, Eric lives in an old house with his lovely wife, adorable boy, giant dog, spotted cat and too many fish.